The genealogy of the trusty polo shirt is a hazy one. 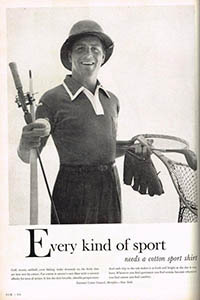 Some believe its origins date back to the 19th century and thought to be developed by British polo players in India who wanted a comfortable shirt in which to play. A common trail of thought is that John Brooks, grandson to the founder of Brooks Brothers in the US, visited England at the end of the 19th century and noticed that polo players had their shirt collars buttoned down to prevent them from flying up into their faces when riding at speed. He carried the idea back to the US and created the iconic Brooks Brothers button-down formal shirt, the style was named 'the polo shirt'. A polo shirt is a short-sleeved relaxed garment often in a knitted fabric that has a short placket front carrying a few buttons and a ribbed collar. Polo shirts today come in many different styles, colours, fabrics and fits and so it can become a little daunting trying to pieice together an outfit. The good news is that the polo shirt is a very versatile little chap and so you can create many looks just from the one shirt. A couple of points to note regarding the fit; generally the sleeves should sit mid bicep and the shirt should end roughly half way down the trouser fly (this helps avoid showing any flesh should you need to raise your arms and also allows the shirt to be tucked in for a neater styling). It's always a good idea to cover off the basic styles of polo for your wardrobe. Plain, block colours with discreet branding are solid styles to start with. Go for pinks, light blues and fresh greens for a modern Summer look or navy, reds and whites for a classic style statement. Here's some inspiration on how to wear the Polo Shirt this Summer.